A key part of your manicure and pedicure consists of cuticle care. Trimming ragged cuticles, hangnails and any dead skin allows the nail bed to breathe and show off sparking healthy growth. In addition, it causes the nails to appear longer and allows for neater polish application. When caring for the cuticles, a cuticle nipper is a sharp instrument used to trim a client’s cuticles, remove hangnails and do away with dead skin. In some instance, a nail technician will use the clip the nails, although this is not the case majority of the time—an even clip of the nails is best achieved with a nail clipper. Once this has occurred, the cuticles and any hangnails are ready for trimming. Buffer: Nail buffers come in the form of a long, rectangular foam block, and typically each side has different textures, each of which are used to smooth the surface of the nails. 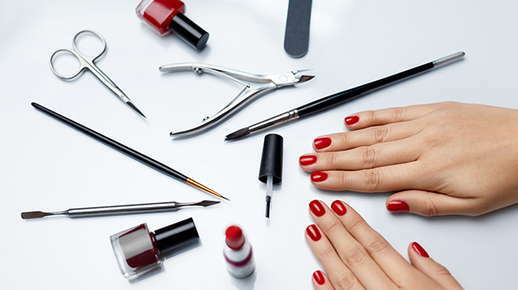 The roughest side(s) iron your nail ridges, while the smoothest polishes them, giving them a glossy finish. Nail clipper: A nail clipper does just that, clip nails and bring them to the length you desire. Its purpose is to make the nails even and evenly shaped. Emory board/nail file: An Emory board/nail file works in close relationship with the nail clipper; it too can be used to bring the nails down to a desired length. However, this is only in the case of short nails—it is much more challenging and time-consuming on long nails. Its main purpose, instead, is to shape the nails—round, square, squoval, etc. Pumice stones: Ready for a science lesson? Pumice forms when hot, molten lava comes into contact with water. This process causes hardening, resulting in stone that is porous and abrasive. It is used on the feet as it has thicker skin and tends to be more calloused. After the feet are soaked in warm, soapy water for about 10 minutes, the skin is softened. To exfoliate calloused, dry areas, the stone is wet then rubbed gently against the skin in a circular motion. Some nail technicians may even put oil or lotion on the stone after wetting it help moisturize the skin and assist with exfoliation. Toe separators: Toe separators are a foam device with grooves and spaces to which each individual toe can fit into. It is used during polish application to keep polish from touching skin of the neighboring toes. Now that you know all about the tools of the trade, your nail salon experience might be more enjoyable. It is not enough to just go in for a manicure and pedicure; when you know the tools and how they work, you can rest assured that your hands, feet and nails are getting the best care possible. Come check out our salon and have your nails groomed by some of the most skilled technicians. During your service, talk to them about the tools we’ve mentioned. Go ahead, show off your newfound knowledge, and learn more as they give you further insight.